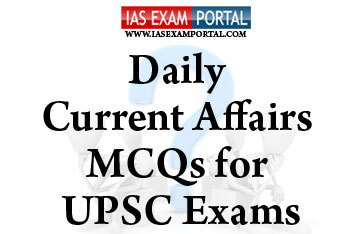 Current Affairs MCQ for UPSC Exams - 11 FEBRUARY 2019 | IAS EXAM PORTAL - India's Largest Community for UPSC Exam Aspirants. Q1. Which of the following statements regarding the open acreage licensing policy are true ? 1) Open Acreage Licensing Policy (OALP) gives an option to a company looking for exploring hydrocarbons to select the exploration blocks on its own, without waiting for the formal bid round from the Government. 2) What distinguishes OALP from New Exploration and Licensing Policy (NELP) of 1997 is that under OALP, oil and gas acreages will be available round the year instead of cyclic bidding rounds as in NELP. 3) The OALP adopts all features ofHydrocarbon Exploration and Licensing Policy (HELP) reduced royalty rates, no Oil Cess, uniform licensing system, marketing and pricing freedom, Revenue Sharing Model etc. 2) Convention on Conservation of Migratory Species (CMS) : To protect the migratory species throughout their range countries. 3) Ramsarconvention : provides the framework for national action and international cooperation for the conservation and wise use of wetlands and their resources. Q3. The Ministry of Finance, Government of India had set up a dedicated fund called Nirbhaya Fund in 2013, for implementation of initiatives aimed at enhancing the safety and security for women in the country. Which of the following statements regarding the utilisation of Nirbhaya fund are true ? 1) It has been used for setting up of Nirbhaya centres near government hospital in every district as first point access for victims of sexual assault and domestic violence. 2) Programme named “SHUBH” for mapping vulnerabilities and identifying areas and categories of women who need special protection measures such as women in prostitution or widowed women. 3) The scheme is not widely used for technological or smart phone based security systems hence majority of young ladies are out of the purview of the final objective of the scheme. Q4. The Government e Marketplace (GeM) and Competition Commission of India (CCI) entered into a Memorandum of Understanding (MoU) to enable a fair and competitive environment in the e-Marketplace. Which of the following statements with respect to this are true ? 1) GeM is a state-of-the-art national public procurement platform of Ministry of Commerce and Industries, that has used technology to remove entry barriers for bonafide sellers and has created a vibrant e-marketplace with a wide range of goods and services. 2) Competition Commission of India is a statutory body of the Government of India, responsible for enforcing the Competition Act, 2002 throughout India and to prevent activities that have an adverse effect on competition. 3) Both CCI and GeM appreciate the importance of advanced analytical tools and processes for identification of malpractices like cartelization. Q5. The newly introduced e-cocoon mobile application serves which of the following purposes ? a) for enabling farmers to get scheme and market updations regarding coconut farming . b) for quality certification in silkworm seed sector. c) it is a single window clearance system for procurement of scrap material from government junkyards. d) it forms a single window clearance system for getting permission for shooting of films in a city/village.